Very nice. I just finished building my new PC yesterday and we have similar parts! I got a Coolermaster Hyper 212 and replaced the stock fan with a Noctua. Used 4 Thermaltake Ring Series fans for my case. This thing runs super quiet and stays around 30 degrees Celcius. Even when I OC to 4.5 ghz lol. ty ty I like animals more than most people as well. Especially turtles and bulldogs. Bulldogs are awesome. [POLL]What game are you looking forward to playing the most? 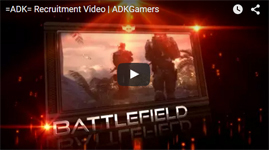 Was Battlefield 3 better than 4? 4 is way more broken. Thats for sure. I like them both. They both have ups and downs. I cannot really choose. But I can say I liked the BF3 maps better. Always remember that there's a loadout for every situation. A change to your loadout will make all the difference when necessary. Sometimes I change mine 4 or 5 times a match simply because the situation calls for it. Also, this game isnt simply just about who has the best aim and/or reaction time. Map control is probably the biggest thing. If you know a map, know the flanks, know where to dig yourself in, you can pretty much be sure you will do well. If you play a match and see someone consistently doing well, spectate them. Watch where they go and how they play and you can get a real time idea of how others play and their tactics. Primarily though, I can't stress enough that the biggest thing in battlefield, in my opinion, is definitely map control. If you have yet to play a fallout for pc then you are in for a treat. I played fallout 3 and new vegas both on console and then both on pc and there's no comparison. If nothing else, the option to mod makes all the difference. graphic overhauls, new weapons, areas, quests, companions, etc. the modding community makes such a huge difference. This show is awesome. If you liked Saul Goodman in Breaking Bad, you should watch this show! I cannot wait for season 2.